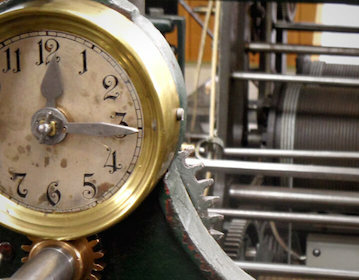 Each clock and especially mechanic ones have their very unique sound. So we thought it was time for us to go out and capture the sounds of ticking, gearing and chiming produced by some very nice exemplars. One part of the recordings features a huge collection of big, old and rare to find tower clocks. These were carefully restored and maintained by a specialist who helped us to operate these complex mechanical devices so that we could record every little aspect of these beautiful machines. These tower clocks are all historical devices, one of them is even dated back to the year 1600. But we were also very interested in the sound of more domestic clocks and recorded all kind of grandfather clocks, mantel clocks, alarm clocks, cuckoo clocks, electrical clocks, pendulum clocks and timer clocks. As always we experimented with different kind of microphone setups. In addition to our Schoeps and Sennheiser setups we also used a very sensitive Schertler piezo microphone to capture the sound directly from the body of the clocks. Another feature of this library is that every ticking sound file can be duplicated as a loop without crossfades and the rhythm of the clock stays in time. We also included a photo of each clock into the metadata of the sound files!